What Is IPv4 & IPv6 Dual Stack and MPLS Technique? We usually see the switch products description as the following “Hardware support for IPv4 & IPv6 dual stack and rich MPLS features provide customers with a wealth of business features and routing functions, as well as hardware-based security features”. Then, what’s the IPv4 & IPv6 dual stack? 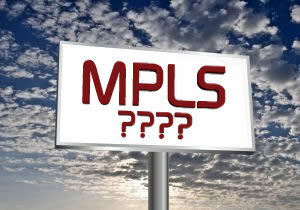 What does the “MPLS” mean? What Is IPv4 & IPv6 Dual Stack? One significant problem is that the two IP address formats aren’t compatible and total conversion to IPv6 is a way off. Internet Service Providers (ISPs) need to provide their customers with both IPv4 and IPv6 service. How to solve this problem? The answer is IPv4 & IPv6 dual stack. With the dual stack solution, every networking device, server, switch, router and firewall in an ISP’s network will be configured with both IPv4 and IPv6 connectivity capabilities. Most importantly, dual stack technology allows ISPs to process IPv4 and IPv6 data traffic simultaneously. MPLS stands for “Multi-Protocol Label Switching”. It is a type of data-carrying technique for high-performance telecommunications networks. In a traditional IP network, each router performs an IP lookup, determines a next-hop based on its routing table, and forwards the packet to that next-hop. Rinse and repeat for every router, each making its own independent routing decisions, until the final destination is reached. MPLS does “label switching” instead. The first device does a routing lookup, just like before. But instead of finding a next-hop, it finds the final destination router. And it finds a pre-determined path from “here” to that final router. The router applies a “label” based on this information. Future routers use the label to route the traffic without needing to perform any additional IP lookups. At the final destination router the label is removed. And the packet is delivered via normal IP routing. Due to the labeling technology, the speed of performing lookups for destinations and routing is much faster than the standard IP table lookups non-MPLS routers have to perform. Besides, MPLS networks achieve greater Quality of Service (QoS) for their customers. FS.COM S5800-48F4S routing switches support for IPv4 & IPv6 dual stack and rich MPLS features and enhanced multicast and QoS capabilities can provide customers with a wealth of business features and routing functions, as well as hardware-based security features. Core Switch & Edge Switch: How to Choose the Right One? MLAG vs. Stacking: What Is Your Option? This entry was posted in Switch & Transceiver and tagged Dual Stack, IPv4, IPv6, MPLS, Multiprotocol Label Switching on May 17, 2017 by Alice.Gui. Layer 2 vs Layer 3 Switch: What’s the Difference? Over the years, the average network has been dominated by the Layer 2 switch. Now as network complexity increases and applications demand greater functions from the network, Layer 3 switches are coming out of the data center and high level enterprise settings. Why this happens? Layer 2 vs Layer 3 switch: What’s the difference? Which one should I deploy? The main function of a Layer 2 is to help the traffic from devices within a LAN reach each other. A Layer 2 switch does this by keeping a table of all the MAC addresses it has learned and what physical port they can be found on. The MAC address is something that operates within Layer 2 of the OSI model (what defines how networks operate). Traffic being switched by MAC address is isolated within the LAN those devices are using. Therefore, when you need traffic to cross between LANs (or VLANs) is when we need a Layer 3 network switch. The most common Layer 3 device used in a network is the router. A router is able to look into the Layer 3 portion of traffic passing through it (the source and destination IP addresses) to decide how it should pass that traffic along. Since a router holds information about multiple networks (LAN WAN VLAN) it is also able to pass traffic along between these networks. This is routing. The Layer 3 switch functionally exists somewhere between being a Layer 2 switch and being a Gateway Router. It can be best described by what more it does compared to a Layer 2 switch and what less it does compared to a Gateway Router. Layer 2 vs Layer 3: What Makes Layer 3 Switch Different? When comparing the Layer 2 switch to a Layer 3 switch the first thing to look at is what additional software functionality you are getting. When a switch supports Dynamic Routing Protocols, it’s no longer a strictly Layer 2 switch. Because static routing allows traffic to be routed between VLANs. In fact, the switches that add only Static Routing to their software features are considered to be somewhere between a Layer 2 and full Layer 3 switch. Sometimes called Layer 2+ or Layer 3 Lite. Unlike Layer 2+ switch, Layer 3 switch is Dynamic Routing ,which are used to link large networks together and share routing tables between them. They can also allow for dynamic routing of multicast traffic on the network. Layer 2 vs Layer 3: To Choose a Layer 2 Switch or Layer 3 Switch? Now that we know the difference between the two layers, what metrics would you choose one over the other comes down to the flexibility of being able to route the packets. 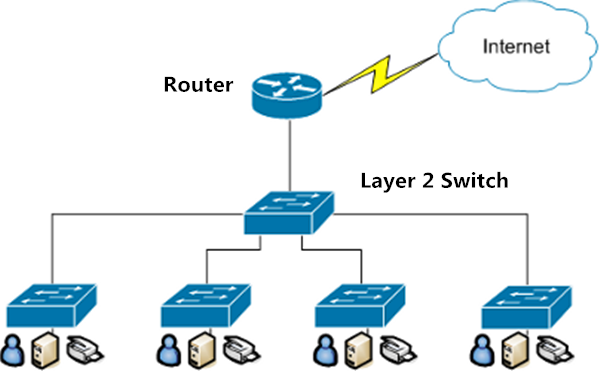 If you need to send data within a LAN, use Layer 2 switch. If you need to send the data to other buildings on campus or to a client site, use Layer 3 switch. 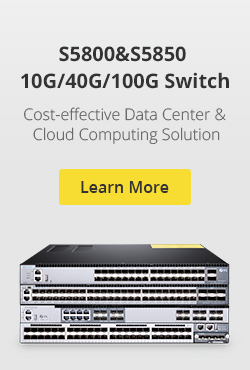 FS.COM provides a series of Layer2/3 10G/40G/100G switches to meet Data Center and Enterprise Ethernet network requirements. If you are interested, welcome to visit our website www.fs.com or contact us via sales@fs.com for more detailed information. Related Article: How to Achieve 10GB in Your Home Lab Under $70? Related Article: Managed vs Unmanaged Switch: Which One Can Satisfy Your Real Need? This entry was posted in Switch & Transceiver and tagged Layer 2 switch, Layer 2 vs Layer 3, Layer 3 Switch on May 10, 2017 by Alice.Gui. SFP+ Direct Attach Cables integrate SFP+ compatible connectors with a copper cable into a low-latency, energy-efficient, and low-cost solution. DAC cables are available in several lengths up to 10 meters (33 ft) and are currently the best cabling option for short 10 Gigabit Ethernet connections. Top-of-Rack (ToR) 10gbe switches use the SFP+ form factor to provide high port density 10 Gigabit Ethernet in an efficient 1U form factor. Server and network storage vendors use 10 Gigabit SFP+ network adapters on their equipment for the same reason. DAC simplify rack cabling and termination. Each server and network storage device can be directly connected to the ToR switch, eliminating the need for intermediate patch panels. DAC are flexible enough for vertical cabling management within the rack architecture. The only cabling outside the rack is the ToR switch uplink connection to the aggregation layer, making moving racks easy. On the market, there are many 10 Gigabit SFP+ network adapters available. Customers require flexible and scalable network adapters to meet the rigorous requirements of running mission-critical applications in virtualized and unified storage environments. Among Intel X520 adapters seem very popular. 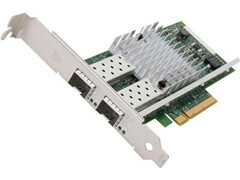 Do you use Intel X520 adapters for your servers? Can’t find right and cheap SFP+ DAC cables for the Intel X520? This blog will give the solution. Intel X520 adapters are provided with 4 models: X520-DA2, X520-SR1, X520-SR2 and X520-LR1. X520-SR1 is shipped with 1 SR SFP+ Optic and X520-SR2 is shipped with 2 SR SFP+ Optics. X520-LR1 is shipped with 1 LR SFP+ Optic. Among X520-DA2 has dual SFP+ ports and has no SFP+ optics shipped, which is the most suitable one for direct attach copper cables and the most popular one on the market. By checking up the Intel X520 adapters data sheet, SFP+ DAC twinaxial cables and SFP+ optics that can be used with X520 adapters are as the following. 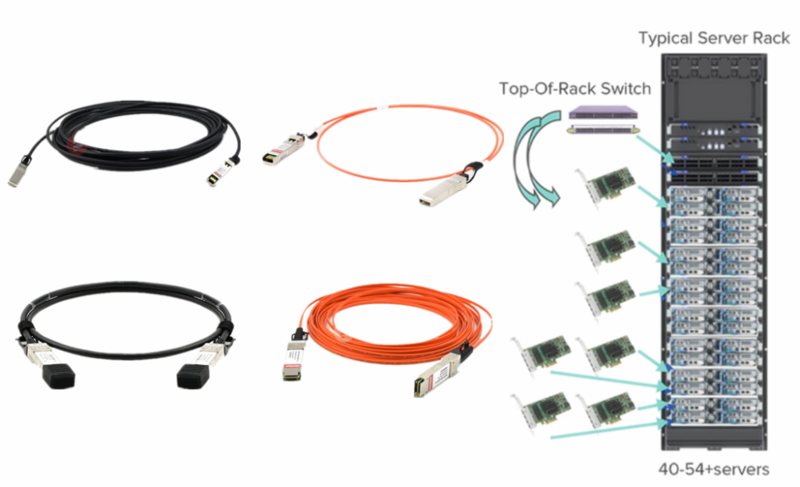 SFP+ direct attach copper twinax cables offer the smallest 10G form factor and a small overall cable diameter for higher density and optimized rack space in 10G uplinks and are ideal for switch and network card connection. FS.COM provides full series of 10G SFP+ cable, which covers a wide range of applications. Both generic and brand compatible versions are available. All SFP+ cables are 100% tested to ensure the compatible and quality. This entry was posted in SFP+ Transceiver and tagged 10gbe switches, Intel X520, SFP+ DAC cables, X520-DA2, X520-SR2 on April 25, 2017 by Alice.Gui. As we all know, 3rd party optical transceivers are much cheaper than Original Equipment Manufacturer (OEM) optical transceivers. Therefore, more and more companies are using and plan to use 3rd party optical transceivers in their network project. However, many original equipment manufacturer published limited warranty policy about 3rd party hardware. Then should we use 3rd party optical transceivers or not? Let’s get a look at most popular network equipment manufacturer warranty policies firstly. When a customer reports a product fault or defect and Cisco believes the fault or defect can be traced to the use of third-party memory products, cables, GBIC’s, filters, or other non-Cisco components by a customer or reseller, then, at Cisco’s discretion, Cisco may withhold support under warranty or a Cisco support program such as SMARTnet™ service. When a product fault or defect occurs in the network, and Cisco concludes that the fault or defect is not attributable to the use of third-party memory, cables, GBICs, filters, or other non-Cisco components installed by a customer or reseller, Cisco will continue to provide support for the affected product under warranty or covered by a Cisco support program. Third-party devices (hardware, software, cabling, etc.) not provided by Juniper Networks, or problems associated with or arising directly or indirectly from such components. Problems with product that have been installed by any party other than (A) Juniper Networks or (B) a party authorized by Juniper Networks. In order to ensure proper operation of Brocade products, it is required that all Brocade systems utilize only Brocade supplied optical transceiver components. Brocade reserves the right to void warranty and service support offerings if optical transceiver components other than those supplied by Brocade are used in the operation of Brocade products. This HP Limited Warranty does not apply to expendable or consumable parts, with the exception of HP printing supplies and certain rechargeable batteries as specified below, and does not extend to any HP Hardware Product from which the serial number has been removed or that has been damaged or rendered defective by software, interfacing, parts or supplies not supplied by HP; HP is not responsible for any interoperability or compatibility issues that may arise when products, software, or options not supported by HP are used; If HP equipment is got defective because of using 3rd party hardware, then HP Limited Warranty does not apply. What is covered by this limited hardware warranty? – This limited hardware warranty covers defects in materials and workmanship in your Dell-branded hardware products, including Dell-branded peripheral products. What is not covered by this limited hardware warranty? – Using accessories, parts or components not supplied by Dell & Commercial hardware products that use, or in which have been installed, products or components that have not been provided by Dell. How long does this limited hardware warranty last? This limited hardware warranty may be voided by Dell, at Dell’s sole discretion, if third party products that were not provided by Dell are installed on your Dell system. Comparing some of the biggest network equipment vendor warranty policies we see that most of them have similar rules on using 3rd party optical transceivers. If problems are caused by 3rd party optical transceivers, then warranty support will be refused until optical transceivers are changed to OEM ones. In the mean while if defect to vendor’s equipment is caused by 3rd party optical transceiver (and it is proved by vendor) then warranty can also be voided. So, this leads to biggest question – Does 3rd party transceivers ensures the same working and quality standards as OEM optical transceivers? The answer is yes! Because 3rd party optical transceivers are manufactured and assembled in the same factories where OEM branded ones are. Optical transceivers are standardized by SFP Multi source agreement. This means everyone can manufacture and supply optical transceivers. 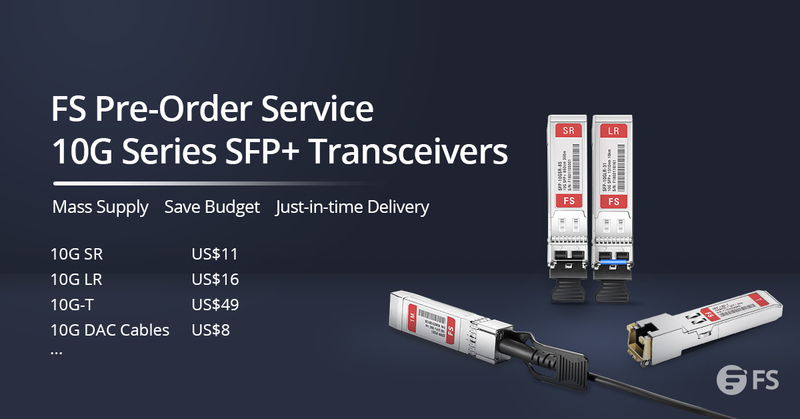 As a result there is absolutely no difference in hardware for official branded transceiver and reliable 3rd party optical transceiver, as much as four or ten times cost difference. The performance is the same because all manufacturers follow same rules same standards. If there is no real difference between OEM optical transceivers and 3rd party transceivers, then why network equipment vendors has such strict warranty policies? That is because network equipment manufacturers has to make money. They will use all available resources to sell more of their production. So they make warranty policies which psychologically affects their customers, making them think that there will problems (warranty void) if they will use other vendor equipment’s (transceivers) in their OEM devices. As the leading global manufacturer and supplier of compatible optical transceiver modules, Fiberstore (FS.COM) always specialized in compatibility breakthrough and insisted on the high performance of the optical components. 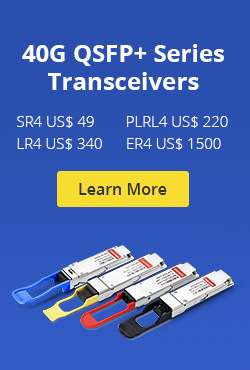 Most of the common used transceivers which are designed to be compatible with many major brands are in stock and with very competitive prices for your options. This entry was posted in Transceivers Common Sense and tagged 3rd Party Optical Transceivers, OEM optical transceivers on April 18, 2017 by Alice.Gui. You may want to connect your desktops, laptops, printers and other machines at your home to the internet and achieve the information sharing. Perhaps you just want to connect your smart phone via WiFi when you’re at home to reduce the usage of your mobile data plan. To complete that, all you need to know is how to build a home network. There are lots of ways to set one up. I’ll introduce the basic setup for the most common case. For person that already have a network, I’II tell ways about how to expand the existing home network in this blog too. The basis of your home network will be Ethernet. This word has a very specific technical meaning, but in common use, it’s simply the technology behind 99% of computer networks. Most computers now come already equipped with an Ethernet adapter – it’s the squarish hole that accepts Ethernet cables. Usually, your broadband connection being cable, DSL, or something else will first go through some kind of device typically called a modem. The modem’s job is to convert the broadband signal to Ethernet. You’ll connect that Ethernet from your broadband modem to a broadband router. Router, as its name implies, is used to “route” information between computers on your home network and between those computers and the broadband connection to the Internet. Each of your computers already has an Ethernet adapter. An Ethernet cable will run from each computer to the router and another cable will connect the router to the modem. Most laptops and portable devices (and even a few desktops) support wireless connection via a technology known as WiFi. WiFi is a short-range wireless technology that you need to provide on your home network, if you want to be able to use it. The most common approach to include wireless capabilities in your network is by using a wireless router. The wireless router combines the functions of two devices: the router, just as we saw before, and a wireless access point. A wireless access point, occasionally abbreviated WAP, is simply a network device that converts the wired Ethernet signals into wireless WiFi signals and vice-versa. Wireless routers are actually more common than their wired-only counterparts in the home and small business networking market. In fact, even if you don’t have a wireless device today, I typically recommend getting a wireless router anyway for future expansion. The number of internet-connected devices that we now deal with is pretty amazing. A typical wireless router or router with a wireless access point can easily handle dozens of devices connected wirelessly. However, wired devices may present problems. Many home routers – wired or wireless – come with only a limited number of connections. It’s common for there to be exactly five connections: one for the internet (“WAN” or modem) and then four for networked devices. If all you have is a four-port router, adding that fifth device looks like a problem. The simple solution is to use a switch. A switch is a semi-intelligent network extender. Its job is simply to make sure that data coming in on any port is sent to the other correct port to reach its intended destination. That’s really all it is. All ports on a switch are equal. In the example below, one port of the switch is connected to one of the ports on the router to which a computer might have been connected. Other computers are then connected to the switch. Switches come in many sizes and often add much more than just a few ports. Common configurations for the home include 8 or 16-port switches. Build a home network is very easy. Usually, the modem is provided by ISP. All you need to buy is the router and some Ethernet cables. FS.COM provides cat5e, cat6 and cat6a Ethernet cables with many color and length options. Snagless boot design prevents unwanted cable snags during installation and provides extra strain relief. Besides, custom service is also available. For more details, welcome to visit www.fs.com or contact us over sales@fs.com. This entry was posted in Transceivers Common Sense and tagged Ethernet cables, Home Network, wireless router on April 8, 2017 by Alice.Gui. Still Confused about CVR-X2-SFP10G Compatibility? 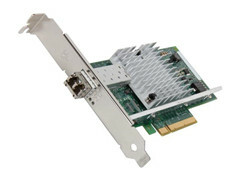 The Cisco OneX Converter Module (model CVR-X2-SFP10G), also known as a converter module, is a hot-swappable input/output (I/O) device that slides into a 10-Gigabit Ethernet X2 slot on a switch. It converts the 10-Gigabit X2 interface into a single 10-Gigabit SFP+ interface. It is supported on many platforms using X2 interfaces. Which platforms are they? In fact, many people are confused about the CVR-X2-SFP10G compatibility. In this blog, I will give some knowledge about the compatibility for Cisco OneX CVR-X2-SFP10G Converter Module. 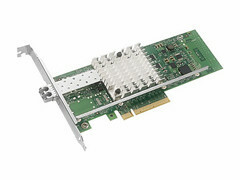 Not all SFP+ modules can be used for Cisco CVR-X2-SFP10G OneX converter module. Table below lists the SFP+ modules and twinax cables that available. Table below lists the fiber-optic cabling specifications for the SFP+ modules that you install in the converter module. Each port must match the wavelength specifications on the other end of the cable, and the cable must not exceed the stipulated cable length. 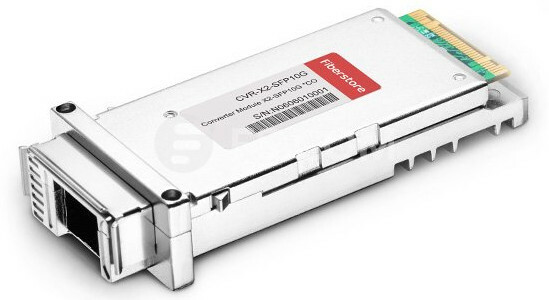 The SFP modules using fiber-optic connections need fiber-optic cables with LC/PC or LC/UPC connectors. There are many switches that have X2 ports, but not all can be supported for CVR-X2-SFP10G OneX converter module. 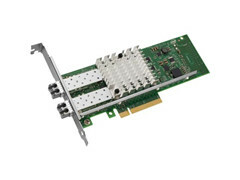 According to Cisco 10-Gigabit Ethernet Transceiver Modules Compatibility Matrix, the CVR-X2-SFP10G is supported on Catalyst 3100 Blade Switches, Nexus 7000 Series Switches, Catalyst 3560-E Series Switches, Catalyst 3750-E Series Switches, Catalyst 4500 Series Switches, Catalyst 4900 Series Switches,Cisco ME 4900 Series Switches, Catalyst 6500 Series Switches. This entry was posted in SFP+ Transceiver and tagged CVR-X2-SFP10G, CVR-X2-SFP10G Compatibility, OneX converter module on March 24, 2017 by Alice.Gui. Computer networks require complicated and specific cabling, particularly in business or academic settings. The cables used in cabling the networks must be made from certain materials. Backbone cabling and horizontal cabling are two main cabling methods used in today’s structured cabling system and neither is dispensable. In order to meet different connection needs, cables used in backbone cabling and horizontal cabling also have many differences from each other. So what’s the difference between them? Knowledge of backbone cabling and horizontal cabling will be introduced in this article. To understand backbone cabling and horizontal cabling, let’s understand the six subsystems of structured cabling firstly. 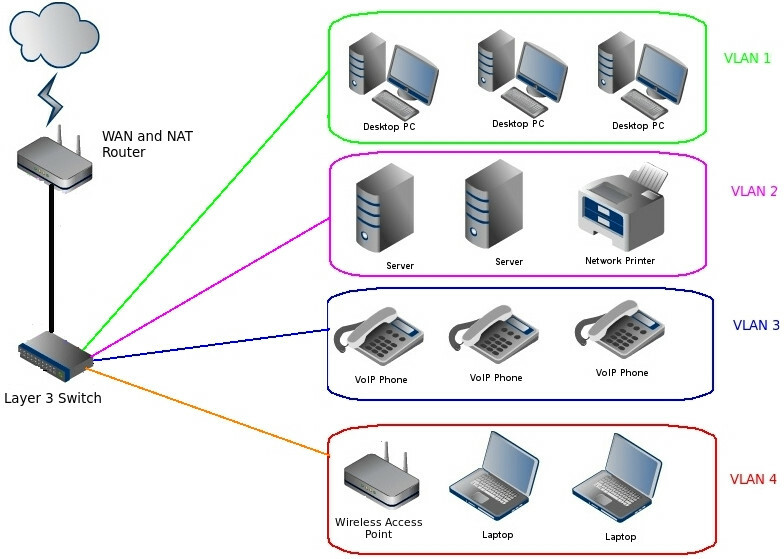 These six subsystems are often found throughout a building and are connected together so that various types of data can be transmitted consistently and securely (as shown in the figure below). Entrance Facility: This room is where both public and private network service cables communicate with the outside world. Equipment Room: A room with equipment that serves the users inside the building. Telecommunications Room: This room contains the telecommunications equipment that connects the backbone and horizontal cabling subsystems. Backbone Cabling: A system of cabling that connects the entrance facilities, equipment rooms, and telecommunications rooms. Horizontal Cabling: The system of cabling that connects telecommunications rooms to individual outlets or work areas on the floor. Work Area Components: These connect end-user equipment to outlets of the horizontal cabling system. The backbone cabling is also called vertical cabling or wiring. It provides interconnection between telecommunication rooms, equipment rooms, and entrance facilities. These backbone cablings typically are done from floor to floor to floor. When setting up backbone cabling, several types of media can be used: unshielded twisted-pair (UTP) cable, shielded twisted-pair (STP) cable, patch cord, or coaxial cable. Equipment should be connected by cables of no more than 30 meters (98 feet). With the emerge of Gigabit Ethernet and 10 Gigabit Ethernet, fiber optic cable is the most appropriate choice for backbone cabling since they provide much higher bandwidth than traditional Cat5, Cat6 or even Cat7 twisted pair copper cables. Another advantage of fiber is that fibers can run much longer distance than copper cable, which makes them especially attractive for backbone cabling. The horizontal cabling system extends from the work area’s telecommunications information outlet to the telecommunications room (TR) or telecommunications enclosure (TE). As shown in the figure below, horizontal cabling is usually installed in a star topology that connects each work area to the telecommunications room. It includes the telecommunications outlet, an optional consolidation point, horizontal cable, mechanical terminations and patch cords (or jumpers) located in the TR or TE. Four-pair 100-ohm unshielded twisted-pair (UTP) cabling (Cat5 or Cat5e cabling) is usually recommended for new installations because it supports both voice and high-speed data transmission. To comply with EIA/TIA wiring standards, individual cables should be limited to 90 meters in length between the outlet in the work area and the patch panels in the telecommunications room. Patch cords for connecting the patch panel to hubs and switches in the telecommunications room should be no longer than 6 meters total distance. Cables connecting users’ computers to outlets should be limited to 3 meters in length. Although the same types of cables are used for both backbone and horizontal cabling, since backbone cabling typically passes through from floor to floor, the cables used for backbone cabling have the very different requirement from the horizontal cablings. Backbone cables must meet particular fire-rating specifications, typically OFNR (Optical Fiber Non-Conductive Riser) rated. If the backbone cable passes through plenum area (spaces in the building used for air return in air conditioning), the cable must be OFNP (Optical Fiber Non-conductive Plenum) rated. Besides, since backbone cables need to have enough strength to support its own weight, cable strength for backbone cables is also different from horizontal cables. And unlike horizontal cables, backbone cables must be secured correctly. As two important parts of structured cabling, both backbone cabling and horizontal cabling play an irreplaceable role. And due to the different cabling environment, backbone cables and horizontal cables may have different specifications. FS.COM provides both Cat5, Cat6 or Cat7 UTP or STP copper cables and OFNR or OFNP multimode or single-mode fiber patch cables for backbone cabling and horizontal cabling. For more information about the backbone cabling and horizontal cabling solutions or other cabling solutions, please contact us via sales@fs.com. This entry was posted in Cabling Solutions and tagged Backbone Cabling, cat7, horizontal cabling, patch cord, structured cabling on March 18, 2017 by Alice.Gui. Cisco Catalyst 4900 series switches were once the most widely deployed ToR (top-of-rack) switches in this industry. This post will introduce the detailed compatible transceivers information for Cisco Catalyst 4948E switch. 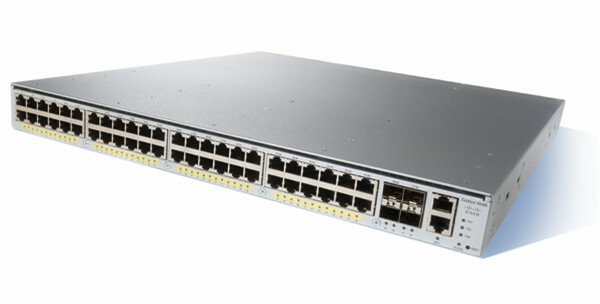 Cisco Catalyst 4948E switch is a one-rack-unit (1RU) fixed configuration network switch with 48 RJ45 ports of 10/100/1000M for downlink and 4 SFP/SFP+ ports of 1/10G for uplink on the front panel. The following picture shows the detailed port information of Cisco Catalyst 4948E switch. 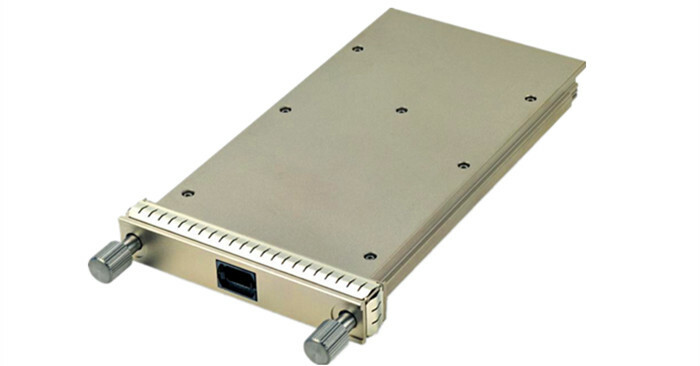 The 48 ports on the front panel of Catalyst 4948E can support downlink of 10/100/1000M. The great advantage of these ports is that they can configure themselves to operate at the speed of the attached devices. If the attached devices do not support auto-negotiation, the speed and duplex parameters can be set explicitly. 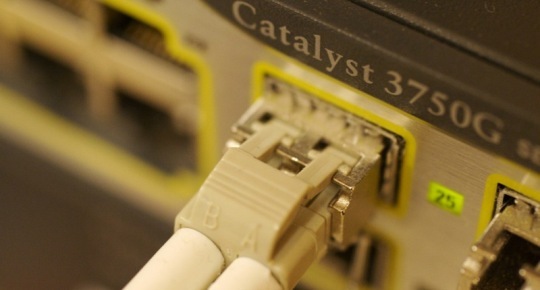 A network cable with a RJ-45 plug at both end can connect Cisco Catalyst 4948E switch to the downlink target devices. The four uplink SFP/SFP+ ports on Cisco Catalyst 4948E can support both copper and fiber optic transmission of 1G/10G by using different modules and cables. In addition, these ports can also support CWDM SFP transceivers and DWDM SFP transceivers. The following part will introduce the details about compatible transceivers for Cisco Catalyst 4948E switch. This entry was posted in Switch & Transceiver and tagged 4948E Switch, Catalyst 4948E, Catalyst 4948E Switch, Cisco Catalyst 4948E, compatible transceivers, network switch on March 10, 2017 by Alice.Gui.